The Bluetooth speaker market is a very lucrative one. Many companies compete with each other in order to create the best speaker. JBL is one of the most popular companies when it comes to Bluetooth speakers. 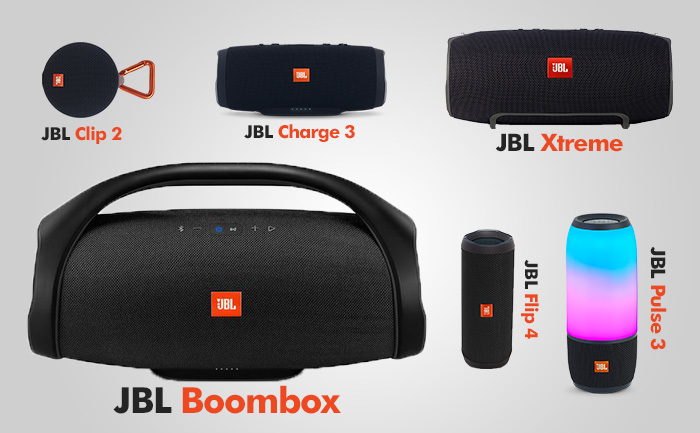 They created a series of devices designed for different applications, from mini JBL Clip 2 to huge JBL Boombox. This time, I’ll compare two devices from JBL: Charge 3 and Flip 4. They are very similar in design. But let’s find out how they compare to each other when it comes to sound quality, connectivity and battery life. 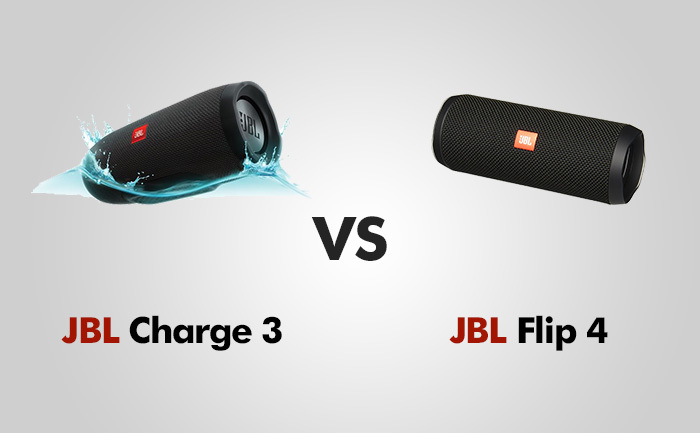 The size of JBL Charge is somewhere between JBL Flip and JBL Xtreme. It’s about the size of thermos flask and its entire body is a mix of hard protective fabric and rubber. This sturdy design makes this speaker great if you have to take it for a trip. type-C USB for charging devices. play / pause / skip track. It comes in a few color patterns: Black, Blue, Camouflage, Gray, Red, and Teal. Flip 4 is smaller and lighter, and therefore more portable than Charge 3. It has rubber caps on each end, with a rubber strip running across its back. The speaker is intended to be used horizontally. It will roll into a position where the drivers point slightly up and toward your ears. You can also place it standing up or use a removable lanyard that allows you to hang this speaker on a branch or attach it to your backpack. Both devices offer the IPX7 certificate. This means that they can be submerged into water up to 3 feet (1 meter) for 30 minutes, so they are great candidates for a travel speaker, especially for those who want to place them near the pool. They don’t float. If you want your speaker to be safe when it falls out while kayaking, maybe you should consider UE Megaboom. Although both speakers have a cylindrical shape, none of them offer a 360-degree sound. You have to be sure that the JBL logo is directed toward your location if you want to have the best experience. Both of these speakers can be oriented horizontally or vertically, but they are intended to lie on their side, otherwise, the sound can be a little distorted due to blocking one of the bass radiators. Charge 3 is equipped with dual 50 mm front facing drivers that can deliver decent mids and highs. But what’s the most impressive in this speaker are low frequencies. On both ends, it has exposed passive radiators that help to produce better bass. It also provides a visual element as the radiators vibrate with bass-heavy music. Flip 4 uses dual 40 mm full-range drivers and 8-watt per-channel-amplifier to deliver legitimately powerful sound that can fill a large room. Although it has passive radiators on both sides, the speaker is smaller than Charge 3, so it can’t deliver as much bass, but it’s still an improvement compared to the previous model. When it comes to mids and highs they are clear, and vocals and instruments like violins are crisp and detailed. Both speakers have a built-in microphone, so they can be used as a speakerphone. They are quite good and people won’t recognize that you talk to them through a Bluetooth speaker. Pairing the devices is very easy – tap the Bluetooth button and find the device listed on your phone. It will connect automatically each time it’s turned on and you can connect up to three tablets or smartphones. The connection in Charge 3 is solid and I didn’t have any issues even when my phone was 30 feet away and there was a wall between. Both speakers are JBL Connect+ compatible, but for Charge 3 you have to check if it’s updated to the newest firmware. This feature allows you to connect two or more speakers and play them in sync, or set one of them as the left channel and the other one as the right for a better stereo separation. You can connect this way more than 100 JBL Connect+ speakers and amplify the listening experience. The JBL app is available on IOS and Android and you don’t really need it unless you intend to take advantage of some of its special features as changing the default function of the play/pause button to activate your personal assistant like Google Now or Siri. The biggest disadvantage of this app is that it doesn’t offer an equalizer, so you can’t change particular frequencies of a song. JBl Charge 3 offers a 6,000 mAh battery that lasts for 20 hours. It has a great feature that most other Bluetooth speaker lacks – it can be used as a power bank to charge your phone or tablet and play music at the same time. So it can be a very handy feature on the trip for someone who forgot to charge their phone. Flip 4 offers only 3,000 mAh battery, which can last for about 12 hours. Contrary to Charge 3, it won’t charge your phone. JBL in many of their speakers includes 5 small LED lights. They indicate how much battery power you still have. PROS: Quite loud / Great battery life / waterproof / Can pair multiple speakers / Can be used as a power bank / Sturdy build / 3.5 mm input jack / LED indicators. PROS: Very portable / Waterproof / Can pair multiple speakers / Sturdy build / 3.5 mm input jack / LED indicators. CONS: Treble and mids could be better / No 360-degree sound. CONS: Weak battery / No 360-degree sound.